As you might remember, this year I'm teaching reading for students in k-3. 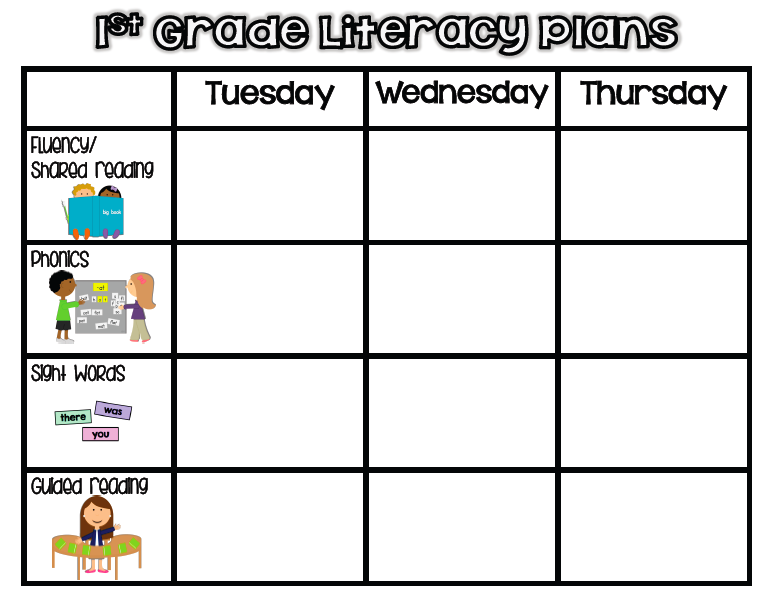 Today I want to show you what my week looks like with my first grade students. (I'll show k, 2, and 3 during another post). 1. 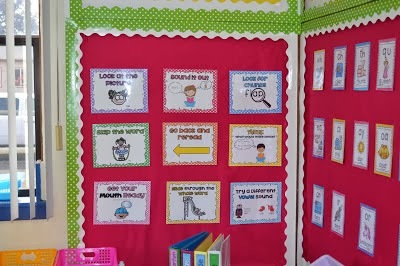 Phonics: I always start with a phonics lesson. I review or introduce the skill and do some modeling first. Here, they are practicing sounding out words with the silent e.
We also did a big pile of real and nonsense words. Here's a favorite of mine. They cover the snowflakes with different onsets to make as many words as they can. I do this first as a group activity where I model sounding out different matches. Then we do several as a group and finally, they do a bunch on their own. Most of my students really struggle with memorizing those sight words so I always try to dedicate time to them. I usually pick a few words to focus on each week, but no more than 2 or 3. Here is a little worksheet I made for them to search for the word there. I really love this font by Carrie because it shows the shape of the word. Click here to get this freebie, along with a few others. They love using beads to make words. I usually have the beads mixed up and they put the beads in order, read the word, then do it again and again. Classic magnetic letters is always a winner! They had to put the letters in order, read the word, then write the word 3 times. Then we rotated seats. Depending on how much time I have, this activity may vary. I use these "fluency strips" to work on fluency (obviously), and to focus on our sight word of the week. I also try to integrate the phonics skill we're working on (some fluency strips with lots of silent e words, for example). Here, I used the words come and/or down in all of the strips. Again, trying to get those sight words mastered! (On this day, they all had to make the word come or down with their beads then read one fluency strip). They practice their fluency strip until they are, well, fluent. Then they read it to the group. I ended up copying these onto blue construction paper. We spent a day working on our cat and dog and narrator voices (because the characters are a cat and a dog). The story on the right uses the words there and where. This is the student's copy. She is highlighting the sight words of the week. I hope to make a pack of these sometime in the future. 4. Guided Reading: This is the part where students get to practice all the strategies we've been working on. During guided reading, we focus on a particular strategy. I start by reading the title and set a purpose for reading. We discuss any vocabulary, as needed. Then the kids "whisper read" first, then we read together. Sometimes I give them sticky notes to use, depending on what our focus is for the day. They love any chance to use a sticky note. :) After reading, we always do a quick comprehension activity (usually questions or a graphic organizer that helps illustrate a skill). I try to focus on a comprehension skill each week, but that doesn't always work out. 5. 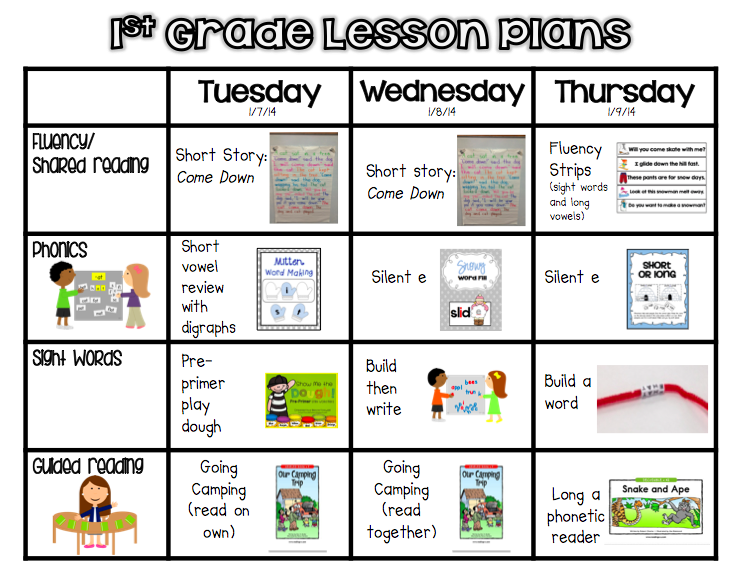 Writing is not on my official lesson plan template, but it should be! I ALWAYS do writing in some way during my lesson, whether it be practicing writing complete sentences or response to reading. It is usually a small writing task, but so important. Head on over to my blog to see more pictures and read in much more detail with even more examples.